Crypto-ML is putting development effort into creating visualizations of its data in order to give members better insight into our machine learning operations. 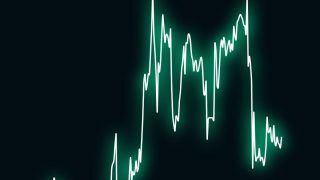 The Crypto-ML Trade Meter is a visualization designed to provide an indication of when a BUY or SELL signal may be nearing. This post will provide information on interpreting the Trade Meter. On the backend of the Crypto-ML machine learning platform, complex calculations are constantly at work. Based on these calculations, a BUY or SELL signal may be issued. You receive this by email or mobile notification. Until now, you didn’t have any foresight that a trade signal may be coming. With the Trade Meter, you’ll now have an idea of how the signals are moving. To accomplish this, our machine learning models now calculate an index, which is a composite measure of the “Strength” of a particular signal. This Strength value is then displayed on the Trade Meter chart. Notice that the SELL signal may occur before Strength becomes negative. This is a result of the Crypto-ML 2.0 Model enhancements, which effectively gave our machine learning models discretion on closing trades early if the market is moving against the trade. The higher (positive) the Strength value, the more likely prices will go up. The lower (negative) the Strength value, the more likely prices will go down. In this case, you can see all signals are positive. This means they are likely in BUY positions, which they are. Out of all of these, ETH appears closest to becoming a SELL. For both BTC and LTC, it will take more time or change in the market to move them toward a SELL position. You could say they are most optimistic that value will continue going up. BCH is somewhere in the middle. The concern with sharing this data is traders may be tempted to “trade ahead of the curve.” That is, if you notice the Strength value rapidly dropping, you may decide to close your trade ahead of the SELL signal being issued. However, the Strength value will move up and down regularly. It will often come near zero and then move back up again. Our BUY and SELL signals are heavily optimized and continuously improved. By anticipating the signal, you may miss out on a resurgence in price. Since the Trade Meter provides information on active trades, it is part of the Trader Membership option. If you’re not yet a Trader Member, you can try it 30-days for free. There are numerous ways to improve the Strength Meter and other visualizations on the site. We will continue to roll out enhancements, but we welcome your ideas and thoughts. Do you have a recommendation? Please let us know in the comments below or in the Community Forums. Thank you!